When “add(2,2)” is called the first time the result will be 4. The next time with the “nisse” the result will be 5. This entry was posted in Uncategorized and tagged decorator, python. 23 year in coma and then in headlines. Rom Houben was thought to have been in coma for around 20 years but then Steven Laureys brain scanned him with positron emission tomography and found that he was minimally conscious. From a German news article it gets into English news and further even to the front page of a Danish tabloid. And the news media had citations from Rom himself: So he can communicate with complete sentences! That is something of a story. That (FC) is a debate that troubles me much more. I myself am sceptical, and that kind of facilitated communication still has a bad reputation, and rightly so. I’m not part of that, and have never suggested using it. So it seems the news media made this story big by not being critical about the FC. And Wikipedia is more credible? This entry was posted in science, society and tagged coma, facilitatedcommunication, neuroscience. In the project Responsible Business in the Blogosphere between Copenhagen Business School and Technical University of Denmark we will try to use text mining on blogs for computerized analysis of so-called corporate social responsibility (CSR). Twitter provides a convenient interface for downloading the tweets on its site and as a start on the project I tried to see how this microblogging service could be used in sentiment and topic analyses. A prototype is now running from the rb.imm.dtu.dk/base Web server, and even a rudimentary sentiment analysis seems to find that for example the company Novo Nordisk has more positive tweets than for example Pfizer has. As of ultimo November 2009 I have put a sentiment analysis of tweets relating to (United Nations Climate Change Conference (COP15) on the main page. It shows a “barometer” reflecting the ratio of positive and negative tweets. The negative tweets may for example be from twitters pessimistic about how we can solve negative consequences of human impact or they may be from twitters hostile to the COP15 meeting. Positive tweets may for example be from twitters excited about going to Copenhagen or from twitters expressing hope. It will be interesting to see the development of sentiment related to COP15, especially during the conference days 7 December to 18 December 2009. This entry was posted in Uncategorized and tagged cop15, sentimentanalysis, textmining, twitter. Google Scholar allows me to see which scientific papers cite my scientific papers. However, it does not order them according to date so I cannot easily identify the most recent papers with cite to me. One way to somehow identify recent citations is to use the “as_ylo” parameter available in the advanced search. With as_ylo=2009 only the papers published in 2009 are shown to the given query. 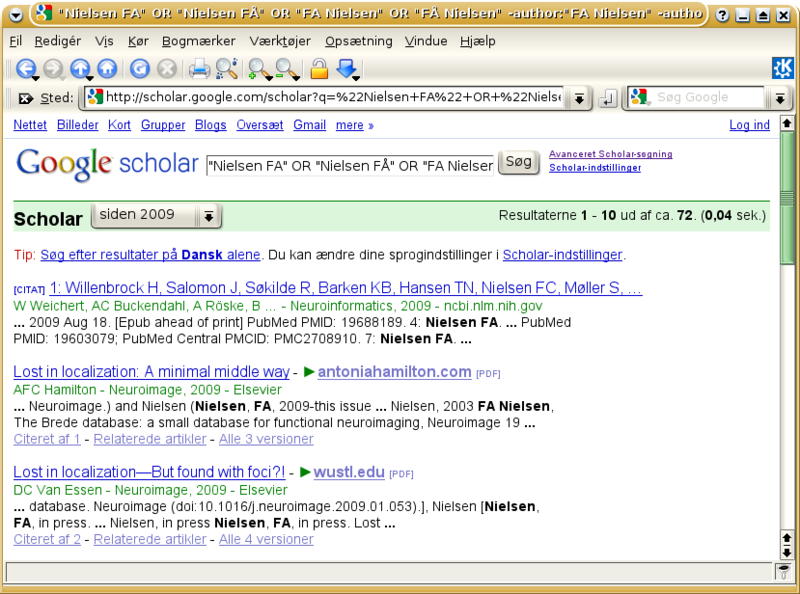 Combining that with a negative ‘author:’ query gets you some of the way, e.g., with “Nielsen FA” -author:”FA Nielsen” (included as_ylo=2009) I find papers from 2009 mentioning ‘Nielsen FA’ that are not authored by me. To get a higher retrieval rate I list some of the different variations of my name in the query. The real query is then (abbreviated) “Nielsen FA” OR … -author:”FA Nielsen” …! It is possible that Google Alerts also can help. This entry was posted in science, technical and tagged citations, google, googlescholar.